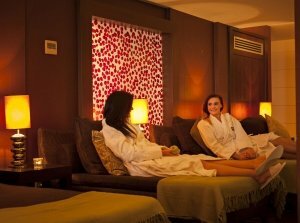 "While the Espa might be expensive compared to other Spas its more than worth the spend. The staff and treatments are excellent but its the indoor . outdoor Jacuzzi/pool and relaxation area that make Espa extra special. To be swimming outside in a lovely warm pool while its freezing cold above the water and looking out at the incredible views is incredible! " A treat in the Winter time! "Overall had a wonderful day, from the friendly welcome on arrival to the most relaxing and enjoyable treatment (back, shoulder, neck and head massage) that left me looking and feeling and smelling great! The outdoor pool and jacuzzi is such a treat.. To be able to swim outside and look at the amazing scenery is such a buzz! The only thing that left the place down was the poor selection of fruit that you receive after your treatment.. Small tooth pick with one strawberry, raspberry and grape! Did enjoy the herbal tea though as I found the relaxation room cool unless you were well wrapped up in blankets. I had lunch in the spa cafe which was okay. The best thing about the day was the actual treatment and swimming outside! Need to warm up the other areas and not so mean on the fruit!" to ever see in ireland. Our treatments were out of this world. Would highly recommend. to ever see in ireland. Our treatments were out of this world. . . . Would highly recommend"